Bites from this species have caused human fatalities. 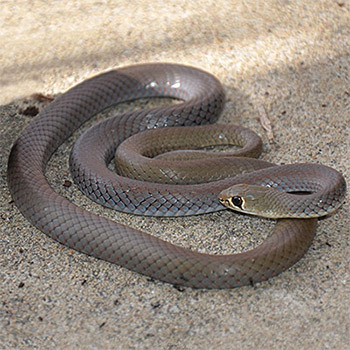 In fact the Eastern Brown Snake accounts for more fatalities than any other Australian Snake. A nervous, ready biter it will defend itself if threatened. Maintains a strong defensive “S” shaped posture. 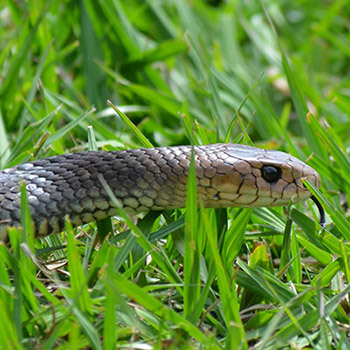 The second most toxic land snake in the world and the most venomous in South East Queensland. Bites from this species should be treated immediately and attended to with correct first aid. Reclusive disposition but will inflate and flatten the body and neck in an effort to intimidate a perceived aggressor. Its supposed fearsome reputation is well exaggerated. 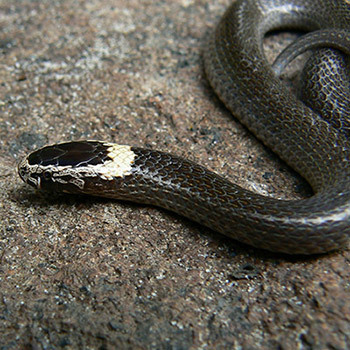 Uniform glossy black above along whole body except tip of snout which is paler brown. Belly has red or pink flush, brighter on the sides & paler in the middle. 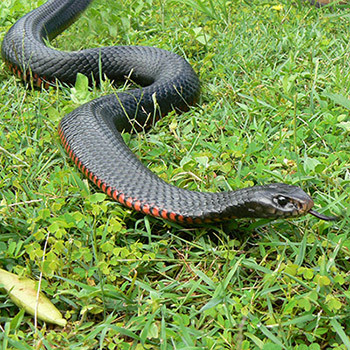 Hind edge of belly-scales is black, creating an even red & black striped appearance. Bites may cause substantial lacerations or punctures. Large, heavy bodied snake with a highly variable, mottled & blotched pattern and colour. Mostly white to cream on the underside. Head is distinct from the neck. 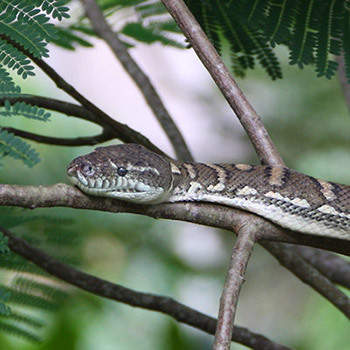 Deeply pitted scales (infralabials) along bottom jaw and to a lesser extent the upper jaw (supralabials) with small “granular scattered scales on top of the head. Inoffensive, will emits a strong odour from the cloaca if handled firmly. Sleek slender body with long, very thin tail. Distinctive ridge extends along outer edges of belly. Wide colour ranges from green, olive, brown & black to rare blue-grey on upper body. Belly yellow or creamy, with bright yellow present on throat. 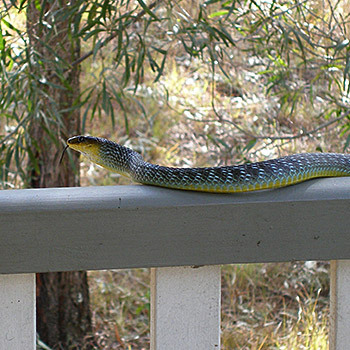 Some specimens with blue or grey belly but generally maintain the yellow coloration.